FromSoftware’s Souls games are often praised for how their settings interlock, their various levels looping back on each other to reveal hidden shortcuts and areas. While such design may make for a more rewarding experience than an entirely linear one, it can also make the game world feel unduly artificial. This is particularly true of the sequels, where an elevator in a windmill leads to a lava castle or a spooky, skeleton infested tomb provides the only access to a vast city. The same could be said of Bloodborne, albeit to a slightly lesser extent. On your first stroll through the vertiginous Yharnam, you’ll walk narrow streets that lead exactly where you need to go and nowhere else, discover impossibly convenient shortcuts unlocked by impossibly inconvenient doors, and maybe even fall down a few open elevator shafts. Indeed, it’s clear from the outset that Yharnam is a city of frustrating impracticalities and incredible coincidences. With that in mind, at some point you have to concede that, sure, these places don’t always make a lot of thematic sense, but it is Just a Game, and what matters is that it’s fun to play, right? Spend a bit of time digging into the lore of this unlikely city, however, and you’ll discover that its one-way doors and serendipitous shortcuts make perfect sense within the game’s Lovercraftian narrative. Upon escaping the clinic you find yourself ensnared within a city of stunning dark romanticism. As if singed by one of the many pyres that lie ahead, the sky itself seems to have caught fire, painting the horizon a portentous orange. Improbably, the immediate route away from this surely very busy clinic, in this city inhabited by thousands, perhaps millions, is up an almost MGS3: Snake Eater sized ladder. From there you follow a series of linear streets where disquieting statues crowd the pavements, coffins wrapped in chains lie unattended, and gravestones planted in the ground block doorways. Straight away this depiction of Yharnam, an ostensibly functional city, doesn’t make sense. But in this case, it’s not because Bloodborne is Just a Game that these streets don’t add up. It’s because we’re as of yet to uncover a key part of the game’s lore. As you continue your hunt the red moon hangs low, beasts rule the streets, and the (eldritch) truth of what is really happening in this brooding city starts to be slowly revealed. In the weeks before its release, Bloodborne was marketed as a penny dreadful, a gothic horror about chopping up monsters in a land where blood is drank like booze and farming equipment is used as weaponry. With the player’s arrival at Byrgenwerth, the school from which the Healing Church originated, however, we see the beginning of a different side to the game’s lore; one in which dreams exist as alternate realities and harrowing tentacle monsters rule the cosmos. FromSoftware is infamous for writing in a way that allows for multiple interpretations, and the hitherto nightmare may very well be a metaphor for the hellish state we’ve found Yharnam in. Now that we’ve progressed the story far enough to know dreams can exist as physical dimensions, however, it’s entirely possible, even likely, that we were never in the real version of Yharnam in the first place, but someone’s nightmare of it; a nightmare in which the city’s erratic geography and macabre streets make a kind of surreal sense. 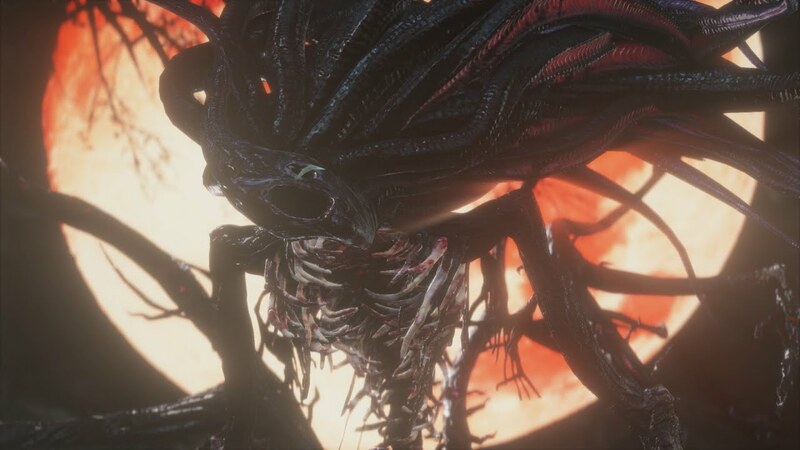 In essence, by setting Bloodborne entirely within one grand nightmare, FromSoftware were able to do all the level design trickery that makes exploring the Souls games so enjoyable and rewarding without having to compromise on the cohesiveness of the narrative or believably of its t world. What makes for a fun game and a good story are seldom one in the same, being two very contentious and disparate aspects of modern game design. Within the dreamworld of Bloodborne, however, we see them in harmony.